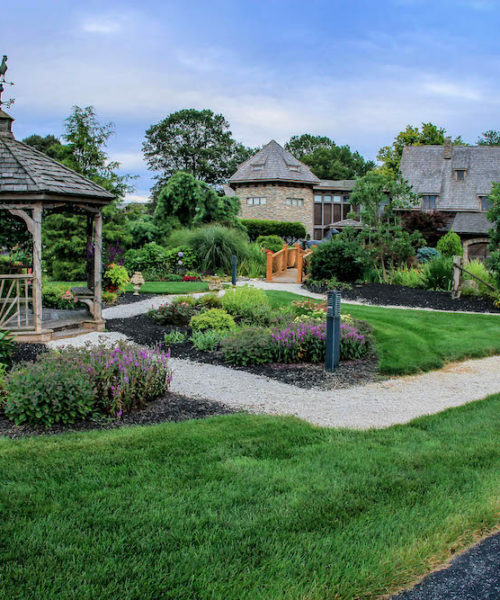 Twin Pine Manor is a hidden gem in Lancaster County, PA! We’re a unique Bed and Breakfast, offering guests upscale accommodations, luxurious amenities, first class service, and gourmet food. If you have ever dreamed of staying the night in a mansion and being treated like royalty, then this is your chance! 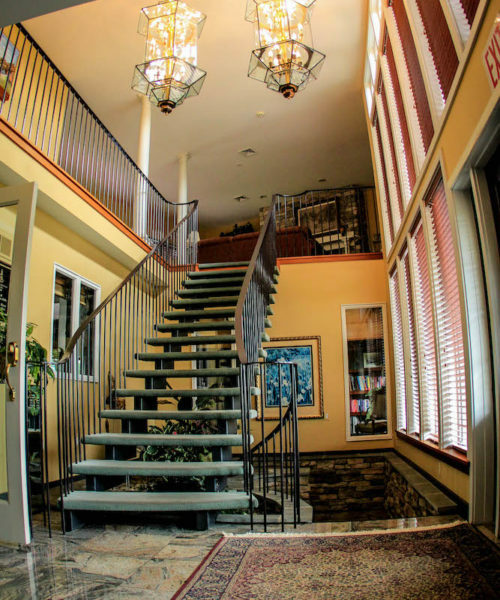 When you arrive, you’ll enter the front door into the granite-floored Foyer with its majestic open staircase. A few steps further is the elegant Dining Room with large windows all around to enjoy the garden view while eating a tasty, homemade breakfast. 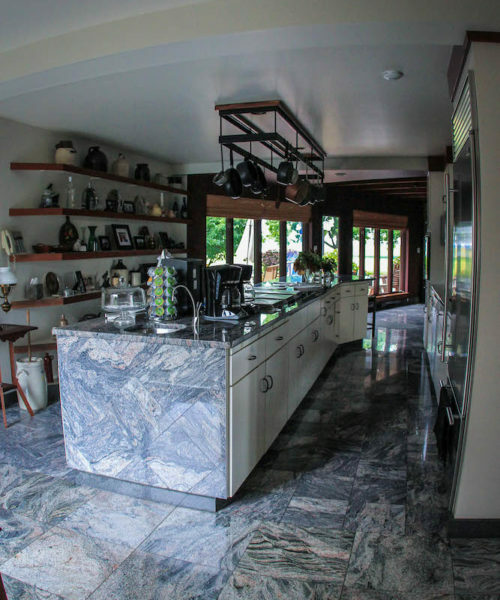 The Kitchen area gives you easy access to cookies and a Keurig machine for self-serve hot beverages and a cozy seating area in front of a large stone fireplace. 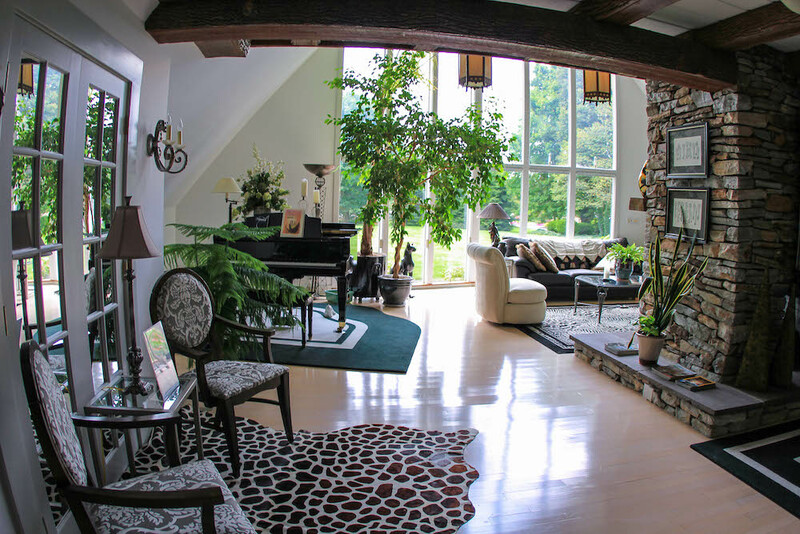 A cathedral-style Great Room offers guests a soothing atmosphere to unwind. The Recreation Room has a large-screen TV, comfy sofa, pool table, and a guest refrigerator with complimentary water and soda. Settle in on the back deck of the main house or other outdoor spaces, including two gazebos and a garden path area, to sip a drink, snooze in the sun, read a book or take in the view. 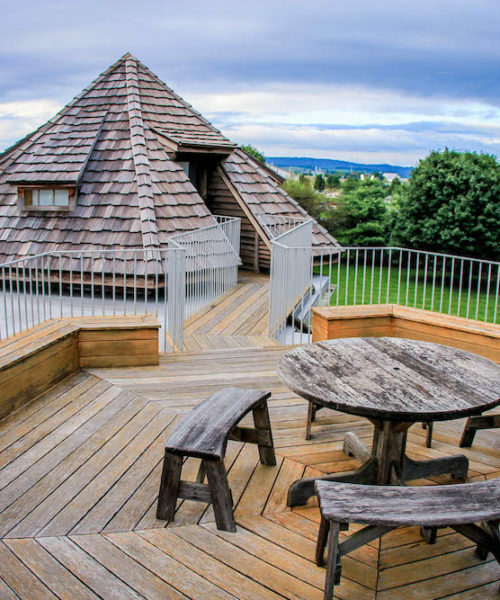 We invite you to linger while enjoying views of Lancaster County farmland from our roof-top deck. Front door entranceway with open staircase leading to second-floor rooms. Grab yourself a complimentary cup of coffee or tea and curl up with a good book at a cozy reading nook next to our kitchen fireplace. 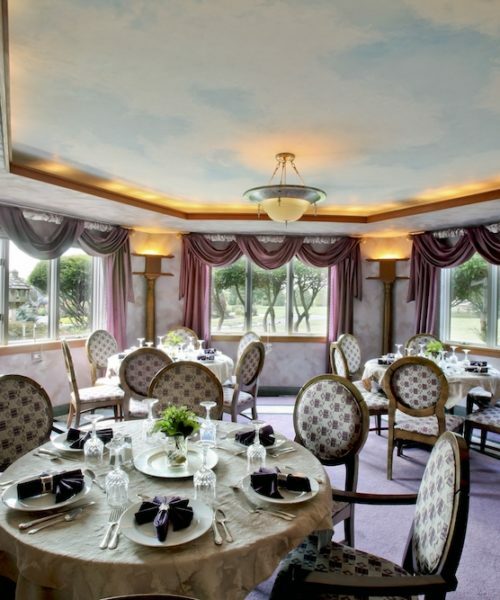 Elegantly appointed dining area with a tranquil hand-painted ceiling, fresh flowers, china and crystal, and a fireplace. A magical setting for our spectacular breakfast. 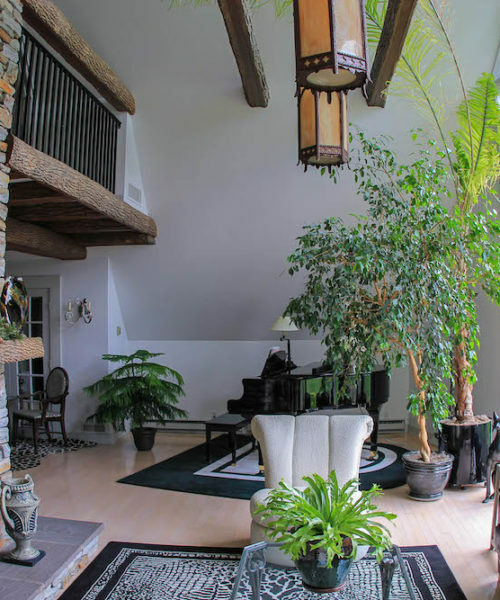 The cathedral-style great room offers guests a soothing atmosphere to unwind in the company of others. A grand piano, antiques from around the world, and a double-sided stone hearth fireplace are among the room’s many features. 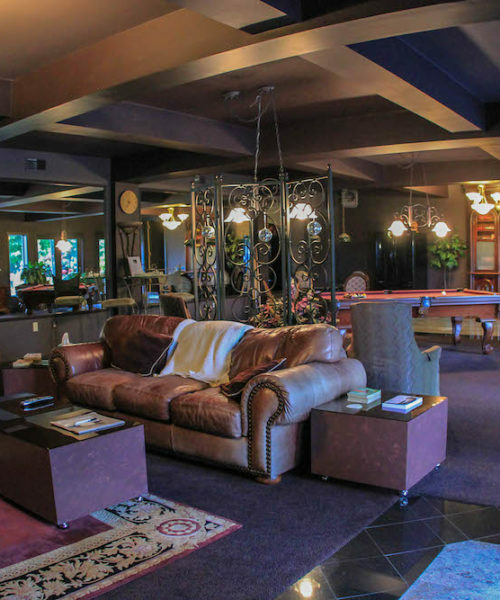 A great place to relax, play pool, or watch TV on our Big Screen while enjoying complimentary snacks and sodas. 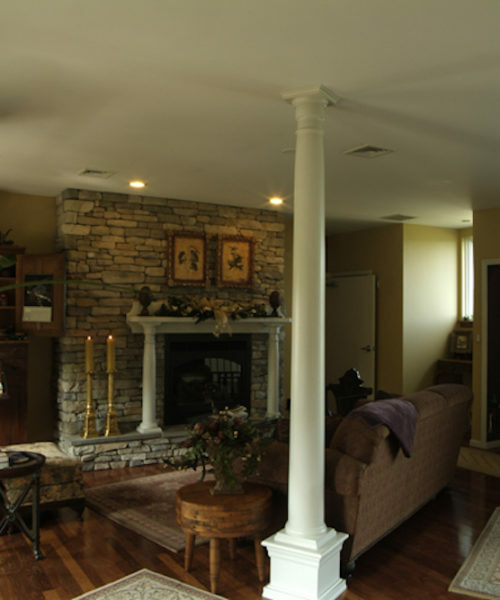 Second-floor common area with hardwood floor and fireplace. Also offers access to rear and rooftop decks. Books & magazines are always available in this area for guest’s convenience. 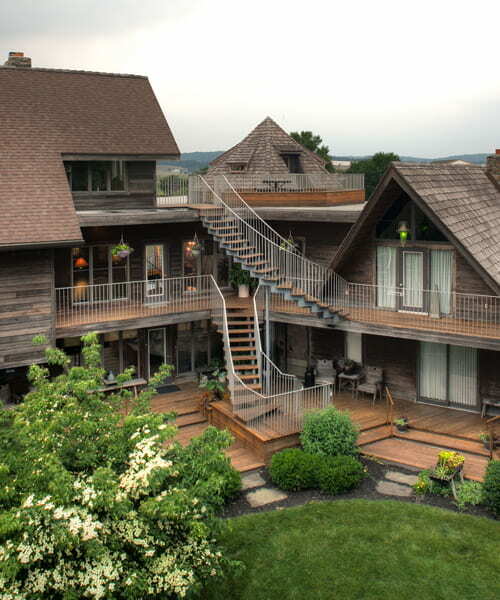 A rooftop, mahogany deck with an amazing view of 35 Lancaster County farms! We suggest having a picnic on our deck or in our gardens. Surprised my wife for July 4th with staying at the Alpine suite. She loved the room and property! Norm is the perfect host with wonderful knowledge and history of the area. Such a beautiful bed and breakfast! We will be returning soon! This is a beautiful place with amazing interior and exterior, every detail is beautiful. Wish we could have stayed longer and we recommend it to EVERYONE and want to go back as soon as we can! 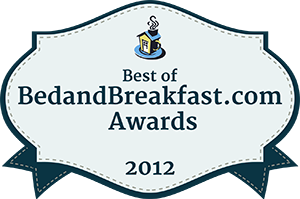 Everything was perfect, including the delicious breakfast served to us Sunday morning. Very happy with our short but sweet stay.